Roboticists have been keeping an eye on squirrels; in particular, their habit of engaging in deceptive practices regarding their hoards of nuts. Squirrels sometimes check a false "hoard" in case other squirrels are watching, just to throw rivals off the track. "This application could be used by robots guarding ammunition or supplies on the battlefield. If an enemy were present, the robot could change its patrolling strategies to deceive humans or another intelligent machine, buying time until reinforcements are able to arrive." 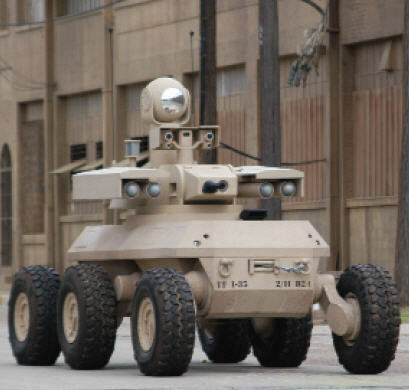 This capability could be built into planned systems like the Lockheed Martin MULE (Multifunction Utility/Logistics and Equipment) autonomous robotic supply vehicle.